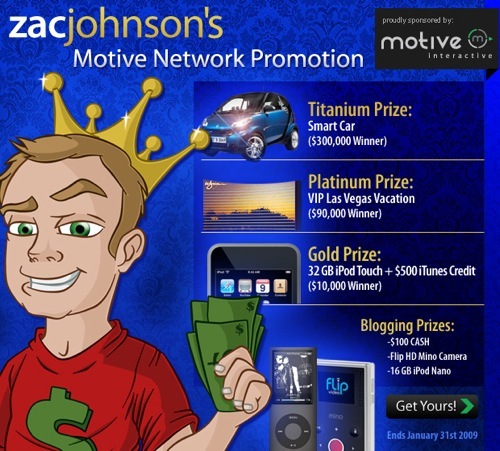 Zac Johnson is holding a massive contest on his blog sponsored by Motive Interactive. Some of the prizes are definitely the biggest I’ve ever seen being given away. The rules are simple: sign up for Motive Interactive and earn as much as you can before January 31st. If you hit a certain tier level, you’ll pick yourself up some fabulous prizes! If you’re not that good at affiliate marketing, you can still enter simply by blogging about the contest. Winners will be revealed on February 1st. Good luck!